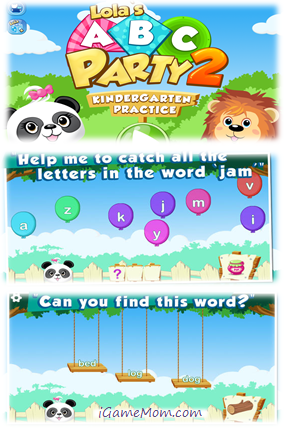 Lola Panda series launched a new app Lola’s ABC Party 2. We reviewed Lola’s ABC Party , and this new app is a sequel to the first app. 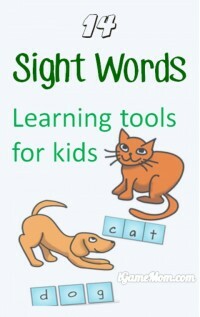 The first app is designed for preschool kids, focusing on letters with some sight words. Lola’s ABC Party 2 is an app designed for kids age 5 to 8, helping kids learn sight words and spelling. In this app, kids will help Lola set up a picnic – they have to help Lola make sandwiches, pick the desert, fill the fruit basket, and make a kite. Before they can even start on each task, they have to answer 10 word related questions. After successfully answering 10 questions, kids can help Lola on one task to set up the picnic. After finishing all 4 tasks, they can visit the party and enjoy some goodies together. There is a parent section, and you have to solve a math problem to enter. It offers an introduction of the game, and access to social media. There is also a section that is linked to the other apps from the developer, you also have to solve a math problem to get in. For young kids, it is a pretty safe learning environment. Lola’s ABC Party 2 works on iPhone, iPod and iPAD. It also works on Android devices. It is $1.99 on both App Store and Google Play. There is a lite version on App Store that is free for you to check it out before buying the full version. Android users can find Lola’s ABC Party 2 on Google Play. Previous post: App Deals : Sushi Scramble: Multiplayer Word Game is On Sale!